Several anglers from St. Charles Parish finished near the top of the leaderboard at the International Grand Isle Tarpon Rodeo held last weekend. Established in 1928, the Tarpon Rodeo is the oldest fishing tournament in the United States. Fishing began Thursday at daylight with the scales closing down Saturday night at 6 p.m. From Bridgeside Marina to the Sand Dollar Marina, St. Charles Parish residents were everywhere, with many taking home awards. The most successful angler from St. Charles was 14-year-old Hunter Harmon, who walked away with two prestigious fishing awards. Harmon caught the biggest mangrove snapper of the weekend, with the fish weighing in at 11 pounds, 10 ounces. 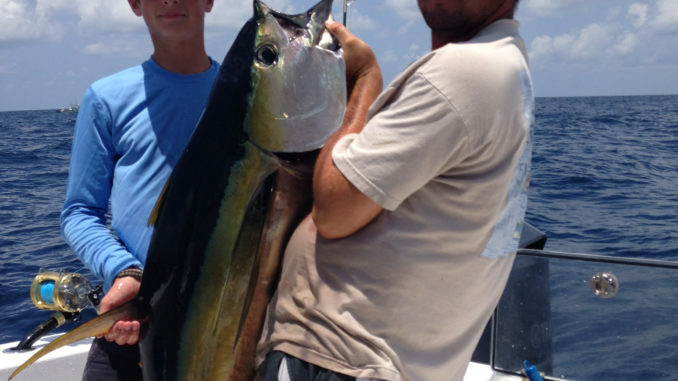 He also hooked and boated the second biggest dolphinfish (39 pounds, 10 ounces) at the rodeo. Other local fishermen also finished in the top three for a wide-variety of fish. Wilton Comardelle III, of Paradis, caught the biggest redfish of the event (40 pounds, 14 ounces), while Destrehan’s Michael Keegan came in second with a redfish that weighed in at 37 pounds, 12 ounces. Caden Comardelle, of Paradis, took home to top prize after reeling in the largest spadefish. Pete Harman Jr., of Luling, caught an 84-pound yellowfin tuna for second place in that division, while Colby Broussard, also of Luling, finished third with a blackfin tuna that weighed in at 25 pounds, 14 ounces. Dustin Dufrene, of Des Allemands, reeled in a 28-pound barracuda that was good enough for second place, while John Bosco, of Luling, caught a 24-pound bonito to finish third.Kris Elliot, of Des Allemands, also placed third after boating a Spanish mackerel that weighed 2 pounds, 10 ounces.